It was a jam-packed weekend just gone – just the way I like it! 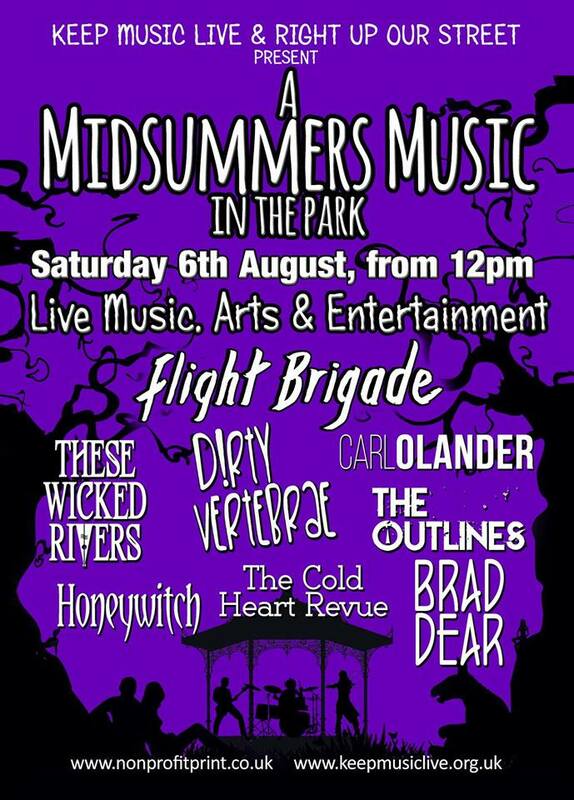 It started with a morning soujourn to Thorne near Doncaster for A Midsummer’s Music in the Park, a reprise of last year’s event. I parked up Ludo outside Becky and Pete’s, got him set up for later in the evening – unfortunately Ella’s train was delayed which put a spanner in our finely honed plans so I grabbed our new camping settee and wandered parkward alone. With the Meadevil Bar in place, inflatables for the kids, facepainting, and a couple of stalls (including the ever-popular magic stall) already in place I found a suitable spot to spend the afternoon, grabbed a cider. The sun was shining, there was good company – aside from rail based delays everything was going according to plan beautifully! I really do like the Memorial Park in Thorne as a place to sit and chill watching good music! The first music was served up courtesy of Honeywitch – stripped down somewhat, with guitar, bass, cajon (I was watching this most carefully) and Claire on vocals. They started with acoustic guitar for more ethereal folksy numbers – Fly With Me kicked off the set, followed with a song whose title escaped me but was about a chap who’d until recently been on death row (having subsequently been exonerated) – with the awesome lyric “democracies die when democracies kill” – succinct and perfect. In a bid to lift the mood, What People Say reminded us of ignoring what gossips might say. The next song had a shantyish feel to it and involved rum (and an inevitable shout out to the absent Brian). The only cover of the set was Joy Division’s Love Will Tear Us Apart – a spooky rendering which works really well in this interpretation. A switch to electric guitar brought a rockier sound – Demon saw Claire briefly transform into a butterfly before hastily discarding her wings. The remainder of the set I only picked up Sirens and Pirates amongst the names – the final song even came with a pretty easy to follow dance (along to the lines “is it a bird, is it a plane, no it’s Superman!” – but definitely a much more agreeable than the 80s school disco staple contributed by Black Lace! I’m looking forward to more Honeywitch at Farmer Phil’s next weekend – they’re doing something quite different to what I’ve heard before! Next up was David Robinson from The Cold Heart Revue – with Ella arriving having had a tiresome journey he perhaps didn’t get the attention he deserved, I was left with an impression of accomplished and gritty blues rock with plenty of slide guitar and harmonica – one song just involved harmonica and vocals, guitar left dormant – it sounded great! He finished up with Jailhouse Rock – definitely deserved closer attention. The very familiar Brad Dear was up next, on his own this time – he was on good form and blasted through a pretty impressive number of songs in a short set! Far Away kicked us off on his folksy odyssey of wanderlust. Long Road Home led into reminiscing about Billy Brown before the travel theme returned with a vengeance with The Only Road That I Know, Special Brew (with attendant conga line led by Joel) and Leave It All Behind. 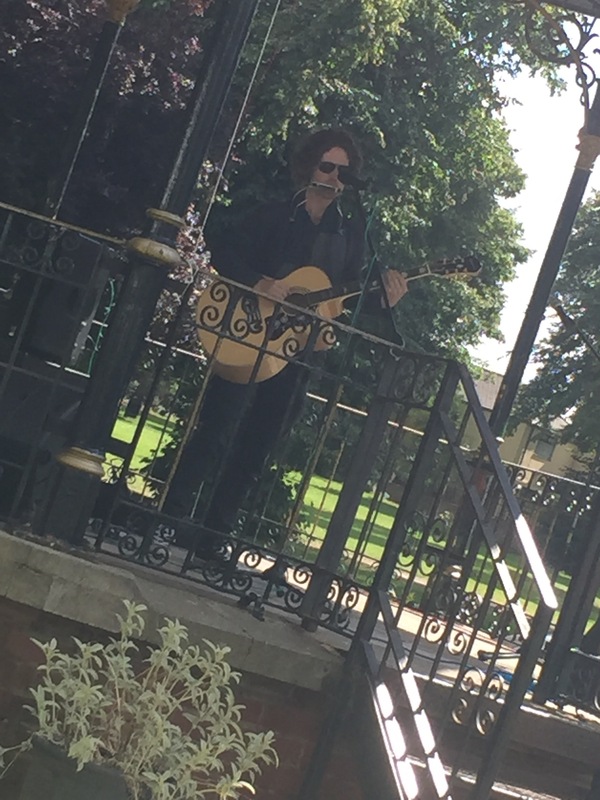 Brad too couldn’t resist a cheeky cover, throwing Wagon Wheel into the mix before heading on back to his own material – Save Our Souls, a new song as yet unnamed and without a chorus, and finishing up with I’m Still Here and Festival Bar Blues. Cracking set – Brad is sounding fresh – and always a pleasure to have the chance to catch up with the rest of Clan Dear as well! 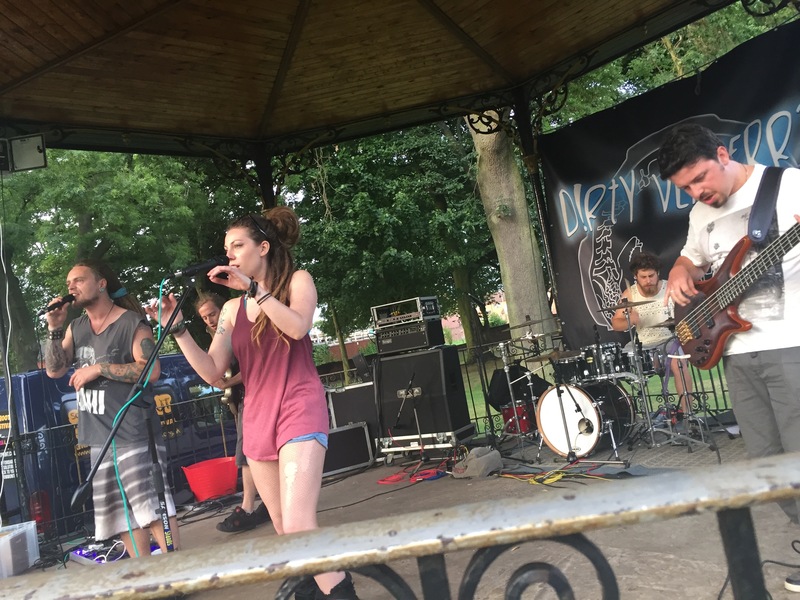 Next up were These Wicked Rivers – a new act on me, pretty heavy bluesy rock is the note I made, they made a great impression as I went and picked up a CD after their set (which I’ve yet to get a chance to listen to, but I’m looking forward to it!). They didn’t let slip what their first three songs were called, although the cover of Keep On Rocking In The Free World caught the ear given that it’s a staple of The Star Copiers set list. This sounded quite different! John Fairhurst is someone I was only familiar with because Pete showed us some videos of him playing after Estival earlier in the year. He’s an unfeasibly talented guitarist with a guttural snarling voice. As he set up Caroline, Becky and Ella stationed themselves front and central as the now shirtless performer got himself sorted with the sound engineer. The note I made was ‘filthy finger picky blues goodness with a stomp box’ – that doesn’t really do it justice! 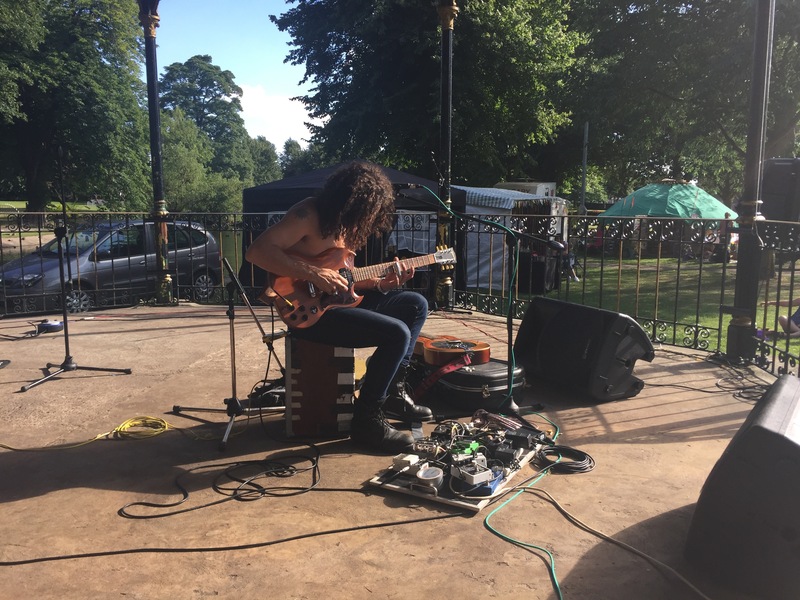 Up on the Hill kicked off the set, followed by An Evening When The Sun Goes Down – an intricate instrumental odyssey which he casually said when it finished that it was just something he’s been working on! Hungry Blues was the only other song title I picked up – but as with the previous band I picked up one of the CDs he’d brought with him – I’m looking forward to getting more acquainted with his music. 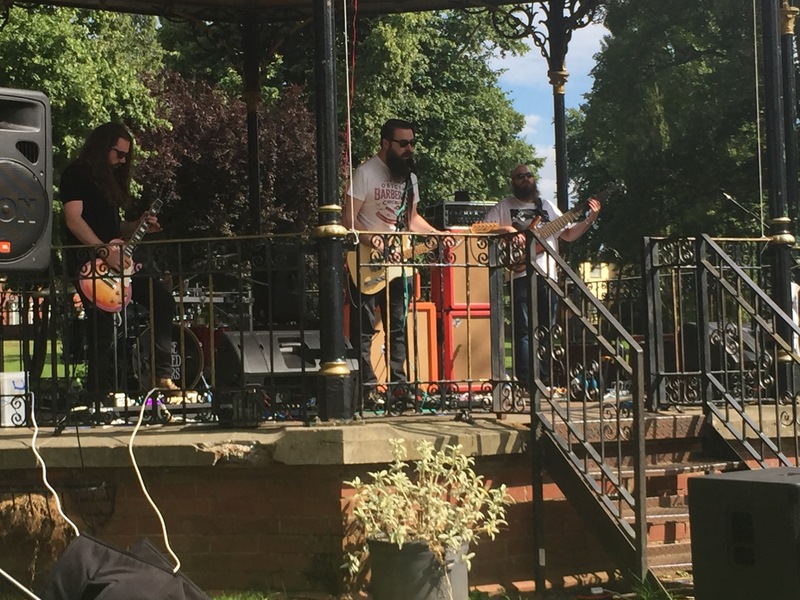 After John had finished there was a bit of an exodus of familiar faces – Mark, Caroline, Dan, Kiara, John and Angela – as they headed to Dronfest in time to catch Ferocious Dog. Michael and Becki had decided to stay having pondered the switch. 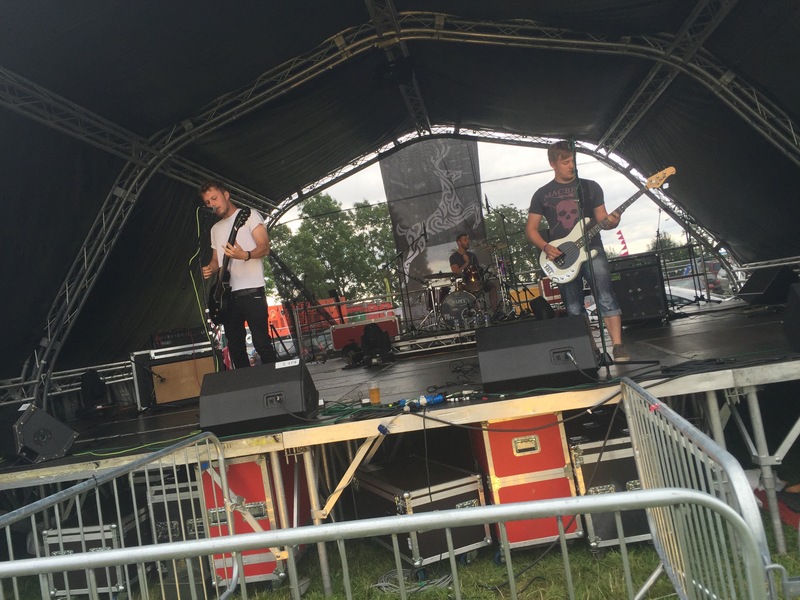 I must admit, it hadn’t even occurred to me to do both, I was more than happy to stick to the one event for the day – after all, we get a double dose of Ferocious Dog at Farmer Phil’s – can’t wait! The Outlines were next – their raw punk quite the contrast from John Fairhurst but it worked well for me – Waiting, Fall To The Drop and Sound of Rain kicked off a fast-paced set. Calm Down was next before they too snuck a cover in with their awesome rendition of Guns of Brixton. Kyle was struggling a bit with his voice, but managed to power through Vanilla Poison, Streets of England and Static before they departed. I managed to completely neglect to take a photo of them too! Not that my photos have been much cop from this event really, so I’ve plonked one in from Deerstock. Oops. Sorry chaps! Having missed Dirty Vertebrae at Deerstock we were excited to get to see them here (indeed, this gig was part of the decision-making process at Deerstock!). 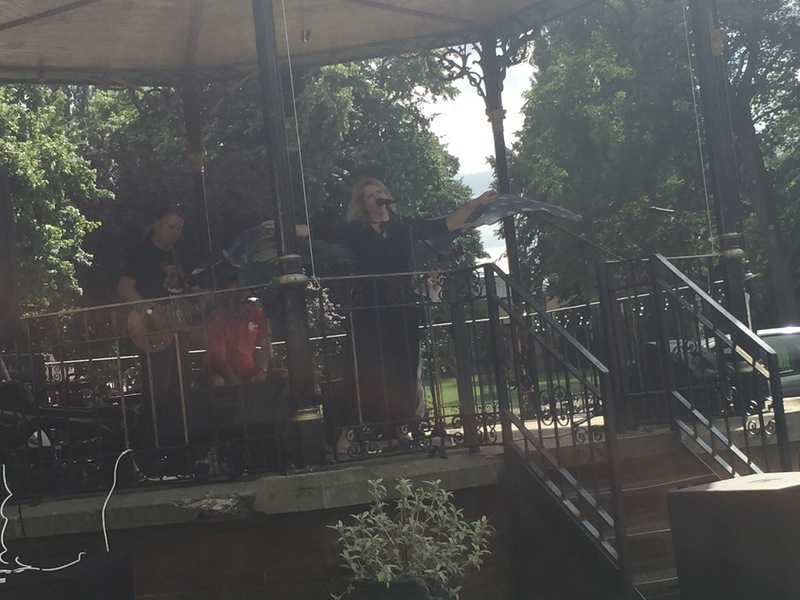 Ella shunned her moped-fall injuries for a dance – the band kicked in in their inimitable fusion of hip hop, funk, rock and heaven knows what else. Slick Smile started, followed up with We Do What We Want then the new reggae-infused song I’ve yet to learn the name of. They dedicated it to Matt who had to make a hasty dash from covering the bar to have a dance! A song whose titled escaped me followed, then the very familiar Melody before new song Taking Over kicked in in frenetic style. Speaking of which, you should check out their their video for this song (below) – Michael mentioned it to me having spotted it on Facebook, I hadn’t seen it at all despite having them on ‘see first’ so maybe you missed it too – pesky Facebook and its pesky restricting of who it shows things to at times! The rest of the set seemed to rush by in a blur – Burial and Living Doll were certainly in there amongst two or three other songs. Loud demands for an encore were heeded with some time made up over the course of the afternoon – so we were treated to Be Yourself and finally Outta Here. 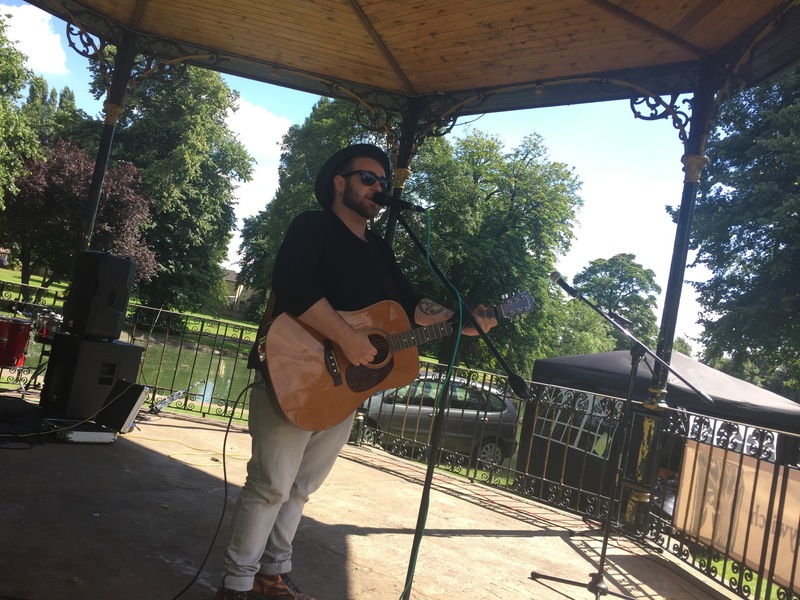 Awesome set – certainly went down well with the familiar faces amongst us but I’m sure the good folk of Thorne must’ve loved it too! The final act as dusk was settling in was Flight Brigade. Ella is convinced we’ve seen them before but I’m not so sure. 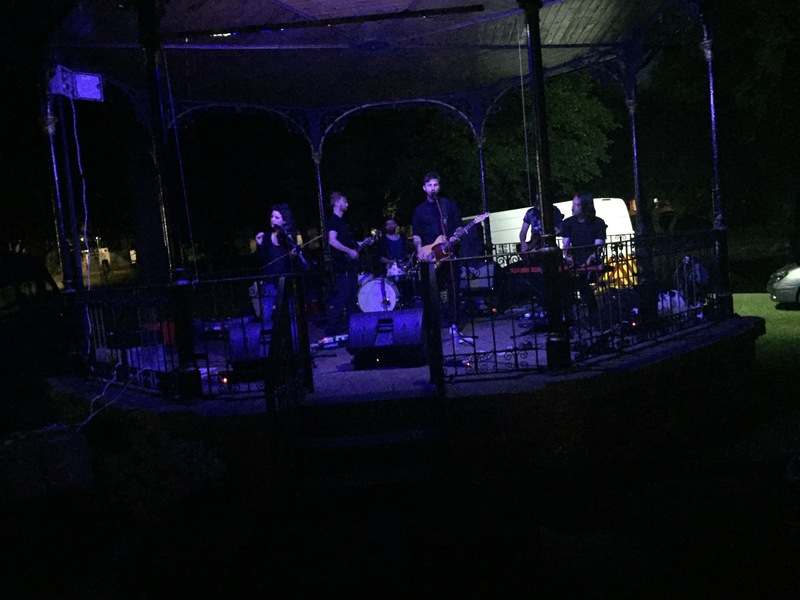 With a darkening sky and a minimalistic strip of LED lighting illuminating the stage it made the keyboard swirling intro all the more atmospheric – with a fiddle, guitars, bass and drums it certainly promised to be a full on sound. I’m not sure how to describe it – progressive funk folk rock? Meh, who needs labels? It was an engaging wall of sound! They kicked off with 39 Steps and took us on a journey of unrevealed song names – intermittently tell us track names like The Phantom or Tearaway. It was engrossing to watch and hear – Our Friends Our Enemies a particular highlight – documenting the heroism of the forced workers under the Nazis who sabotaged the munitions they were working on to limit damage to the allies. They finished up with When The Water Whispers before an encore that I didn’t catch the name of. They’ve got an album out – Our Friends Our Enemies – I’ll be certainly picking it up, I found them intriguing. I don’t know if they had CDs with them but I’d already spent my CD allocation on previous acts! A quick pack down followed – we helped a little bit, at least by distracting the kids whilst Becky, Pete and crew did the bulk of the work (turns out Pokemon Go and a phone handed to a child is a great distraction technique – who knew?) before we headed back for the now traditional post-party-in-the-park takeaway pizza order, drink and natter before taking ourselves off to bed – it’d been a long ol’ day – but a bloody good one!